Walker & Company, 9780802710932, 437pp. The Spanish-American War ended over a century ago, but its effects are with us still. 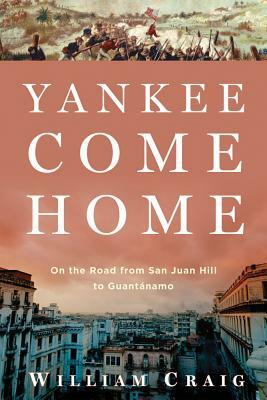 In "Yankee Come Home," William Craig travels through Cuba, the birthplace of American imperialism, to find out why our republican ideals died in the glory of San Juan Hill, and to reveal Guantanamo, the corner of Cuba we've never left. I n doing so, he recounts more than a century of the fascinating, but none-too-flattering relationship between the United States and Cuba. Through present-day adventures-spirit-possession rituals, black market odysseys and roots-music epiphanies-Craig explores what that relationship has wrought in the lives of Cubans and A mericans alike. Craig was drawn to the Cuban-American story by memories of his mysterious great-grandfather Thomas O'Brien, a self-proclaimed hero of the "splendid little war" whose legacy of glorious, painful lies left his own children wondering who he'd really been. Like the reality of "Papa" O'Brien's identity, the story of the United States' 1898 intervention in Cuba reflects more hubris than heroism, more avarice than sacrifice. But in the end, despite America's unseemly history there, Craig's journey through Cuba and its history takes him to a greater understanding of both countries. His observation that "at Guantanamo, freedom is in trouble on both sides of the wire" applies to the past and present of the United States as well as Cuba. William Craig, a journalist and professor at New Hampshire's River Valley Community College, has written for the Boston Globe, the Hartford Courant, the Spectator, and the Boston Review. His fiction has appeared in StoryQuarterly and the New England Review.